Here’s one for you: Let’s suppose you only have less than 100 daily visitors to your blog. How do you make money with that blog? You don’t – seems like a sensible answer. Contrary to popular belief, even new and low-traffic sites can still make you money. However, you won’t get there with sponsorships, advertising, affiliate marketing, or selling small info products. Making money with a small site requires a bit more hustle and creativity. One way to do it is through freelance blogging. Just to give you a small definition (if you’re not familiar with the concept), freelance blogging is about you finding other blog owners that need content, and providing it to them. Well, I have to admit, it does seem simple in a sentence like that, but as always, everything’s easier said than done. At the end of the day, freelance blogging is just like any other career path – you need to put in the work to see the results. There’s no way around it I’m afraid. That being said, you can use some hacks along the way to make this new interesting career much easier. Where by hacks, I actually mean tools and resources. So this post is going to be more about the what than about the how (let’s leave that for another time). This list here consists of 19 tools that I find incredibly useful in my day-to-day work. And to make this extra usable, I’ve divided the list into six categories, so you can get to the exact tool you need right away! Freelance blogging requires a lot of self-discipline and the ability to manage your work, projects and individual tasks effectively. So if I were to point out the most crucial category on the list, this would be it. Free Mind – THE productivity tool in my freelance blogging arsenal. It’s the easiest to use mind mapping software out there. The overall keyboard-friendly interface makes it extra fast to interact with. You can use it for creating plans of action, brainstorming, or laying out your business strategies. Asana – Project management / task management / teamwork tool. This might sound like it’s a lot of stuff cramped into one tool, but Asana actually pulls it off quite well. It allows you to manage all your tasks and projects, and gives you a beautiful environment around it. Plus, there are apps for all major platforms. Tomatoi.st – The tool lets you in on the Pomodoro Technique in its most basic implementation possible. You get a timer with three presets (Pomodoro, short break, long break) and nothing more; yet it’s all you really need. Songza – Songza is a very interesting concept. Basically, it’s a background music radio. There are categories for things like: relaxing at home, cleaning, working out, working/studying and many more. If you’re a fan of listening to music while you work, check it out. For additional tools to save you time and help you stay organized, read this post. Research is an important part of being a freelance blogger, especially if you’re just starting out and don’t have much word-of-mouth marketing going for you. Now, the sites listed here might not all be that obvious – not all of them were created with freelance blogging in mind, but they do work quite well once you get a hang of them. Flippa – It’s a site flipping marketplace. The way you use it as a freelance blogger is by checking the recently sold sites and reaching out to the new owners with your offering. The reasoning is this: since they have a new site, they might be interested in some new content as well. Technorati – The best blog directory of them all. Browse it by category, identify the blogs you think could use your help and then reach out to them. (Update: Technorati recently closed their directory). Jobs.ProBlogger – The only decent job board for bloggers. Where by decent I mean that you can actually find some good paying gigs there. This is where we’re getting into the core element of your work as a freelance blogger – reaching out to prospective clients and convincing them to buy your services. Bidsketch – It’s the top client proposal tool out there. It takes care of the design of your proposals, the process of sending them out, and then letting you know how effective they are. Plus, there are also some cool proposal resources you can use when building and perfecting your pitches (like these templates for freelance writing proposals, for example). BuzzStream – BuzzStream is a true workhorse with a lot of things to offer. In fact, it is a research, social media, and outreach tool all at once. In a way, it has to be all those things to deliver its main functionality, which is allowing you to find relevant sites, evaluate their authority, and then send optimized outreach messages. And all this is happening without leaving BuzzStream. Yesware – If you prefer sending your pitches via email, Yesware is the Gmail plugin you need. The basic functionality of the thing is to let you know whether or not people open your emails. This allows you to follow up with a phone call at just the right moment. Rapportive – Another Gmail plugin. This one’s for spying on your contacts. Whenever you’re trying to send an email to someone, the plugin tells you their name, social media details and other interesting bits of information you can use in your communication. I’m a big WordPress fan, so I do most of my writing straight inside wp-admin of my blog. Even if the work is meant for a client, I still write and edit the post on my blog first, and only then move it somewhere else. Here are the tools (and plugins) that make the process truly easy. The Edit Flow plugin – This little plugin is brilliant. Among other things, you get to set custom post statuses to help you organize your different posts along the publishing process. I, for instance, use statuses like: Archived, Finalized, Edited, Pending Review, Draft, Outline. Pacemaker – This is actually both writing and productivity tool all in one. It lets you set your writing schedule by adjusting the number of words you should manage to write each day. Really useful when working on bigger projects. Hemingway App – This is a very cool editor’s aid app. It takes a look at your post / article, and highlights everything that could be improved from a readability point of view. It’s a good idea to put your every post through this app prior to sending it out. Making sure that your data is safe and sound is the most important technical task you can have on your to-do list. It’s simple, if you lose your data (articles, client information, whatever), it will set you back months, or maybe even kill your business altogether. So here are the tools that will help you sleep better at night, knowing that your stuff is being looked after. Dropbox – Okay, let’s start with the obvious. I’m sure you know what Dropbox is, so I’ll save you the pitch, but I will mention one additional piece of the data puzzle. It’s the WordPress Backup to Dropbox plugin. It will take your whole blog and keep it updated in your Dropbox account at all times. If you ‘re after some more advanced features, you can find more backup plugins here. Evernote – Create and manage your notes in the cloud. Those notes can be anything. Evernote can easily handle every bit of information that’s important to you – text, photos, videos, etc. 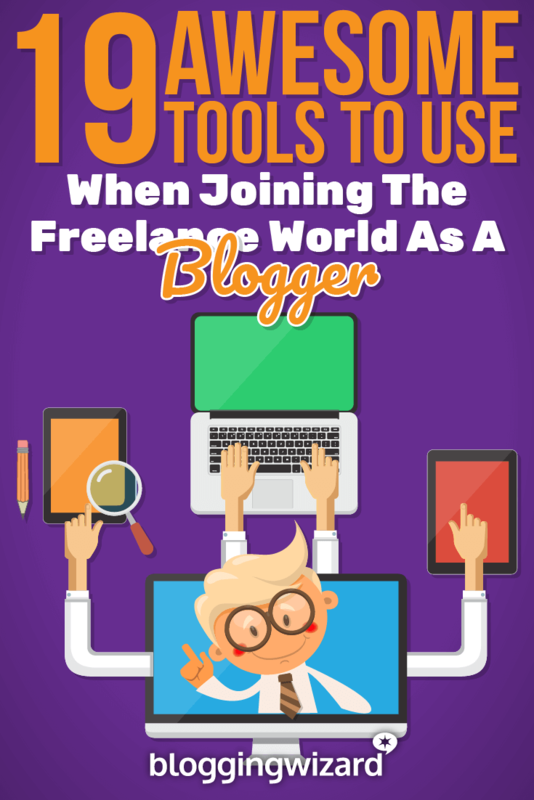 It should be more than enough for your freelance blogging purposes. IFTTT – IFTTT stands for IF This Then That. It lets you create connections between a number of other tools to keep the information flowing in the direction you desire. For example, you can set it to keep a phone call log in Google Drive (handy for following up), or to upload your mobile screenshots to Dropbox. There are literally hundreds of available recipes. Let’s talk some money (finally)! Here are the tools to use to make your billing process straightforward and easy to handle. Toggl – Great tool for time tracking. This is especially useful if you’re billing your clients on a per hour basis. There’s a web version available, plus a desktop app. FreshBooks – Very easy to use personal accounting tool and invoice manager. Creating a new invoice and sending it out takes literally a couple of minutes. Also, it’s free to get started with your first client. Whew … that was a lot of stuff! I know that the list might be a bit intimidating if you’re not familiar with some of these tools. But I can guarantee that they will make you more productive and more effective when handling your freelance blogging tasks right from day one.